E.g. for Canon XA20, XA25, XF100, XF105, XF300, XF305, Sony NEX-FS100, NEX-FS700, HXR-NX30, HXR-NX5, PMW-100, Blackmagic Cameras and many others. The Cargo Case Camera Edition has an ultra-light design, featuring dual-rigidity foam for maximum equipment protection. 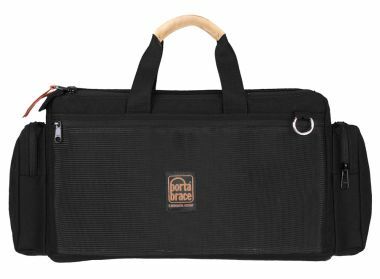 It is designed to fit Pro Video Cameras up to 21.75" long and works best for with cameras including the HM600, PMW200, AC160, HPX250, XF100, XF305, C300, and Blackmagic Cinema Camera. This rugged case is constructed using long-life materials including 1000-denier Cordura® nylon and solid steel clip rings. Reversed zippers and a slip-not anti-skid waterproof bottom panel are used for increased water-resistancy and durability. Arrive at your venue in Shoot Ready™ format knowing everything you need is packed, organized and accessible. The 9" interior height allows for shoot-ready equipment configurations and the easy-open, quick-draw design means you'll never miss the shot. There are front and back slip pockets for carrying SD cards, documents, cords, and white balance cards. The 2 side pockets are perfect for batteries, extra flashes, and cords.